They are easily accessible, can feed information directly to a database and replace tree-killing paper versions. They are difficult to style, require massive validation and and the elements look drastically different on each browser. And don’t get me started on accessibility. It takes a lot of work to make forms accessible to those using assistance devices. Yet, it is worth it – people with differing levels of sight and mobility deserve to be able to use your form. And sometimes, your form becomes the only option when they can’t interact with the paper version. Labels and titles that make sense. Validation that works with screen readers. 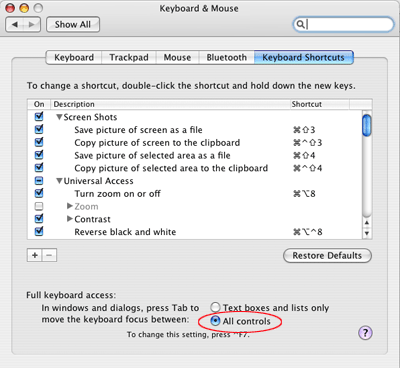 You see, buried deep in the system preferences (the computer’s, not the browser’s) is a setting for “Full Keyboard Access” that is set, by standard, to skip select, and radio button inputs. FireFox seems to respect this and skips those elements. Good for FireFox. Bad for users. The funny thing is that Safari partially ignores it and allows you to tab to select inputs. However, radio buttons are still out. … but of course the setting to recognize radio buttons IS A RADIO BUTTON! So, good luck navigating to it via the keyboard. After posting, I realized that the default setting is for Text boxes and “Lists”. I guess this means select input elements – so Safari is the one fully respecting the preference settings. Still not cool to users.